When I started this journey with Operation Orphan little did I know where it would lead! A couple of years ago while on holiday I got the chance to go to a Loving Hands (Crafting for Charity) meeting near Nottingham, where Cyrilyn Moore was a guest. She had come to tell us more about her charity and take away donations of handmade items we had brought – mine all the way from Shetland included the first blanket I had made for charity having only made smaller things up to then. Since that lovely afternoon I have regularly sent boxes of hats, gloves, scarves and blankets to Operation Orphan, made by myself, friends, family and complete strangers who leave items for me to pass on in one of the collection points we have around Shetland. Last year I contemplated applying for one of their expeditions but missed out – she who hesitates … Then at the end of the year I got my 25 year bonus from Shetland Islands Council and decided it was going to be spent on going with Operation Orphan to Moldova in 2015 if they would have me – they said yes! I started fundraising for the charity as part of my commitment to the trip. Friends generously donated online and I started a crochet-a-long blanket called Sophie’s Universe that was destined to be 6 feet across when finished for which I am selling raffle tickets. Sophie is now finished and so far the blanket raffle alone has raised over £400 with my fundraising total at over £700 including the money raised in an Easter Egg Raffle at Ollaberry School where I work. When Operation Orphan started advertising for people to hold collections of winter clothing for distribution to Moldova, Ukraine and Nepal I wondered what we, here in Shetland, could do. The cost of transporting large quantities of goods from here is prohibitive as everything goes by sea. Only recently have we been able to take advantage of using Collectplus to send up to 10kg for £8.65 via Tagon Stores and the chances were if we started collecting it would take a lot of 10kg parcels! I mentioned this problem to a member of the local Rotary Club and he suggested I write to the club and ask if they could help in any way. The result was a cheque for £250! Thus armed, I decided to go for it and launched a Shetland wide appeal for warm winter clothing using BBC Radio Shetland, online Shetland News, the Shetland Times newspaper – and lots of Facebook groups. A local transport firm, JBT, came onboard and offered to help deliver donations to Nottingham. We were set to go! Then the donations started to trickle in along with the offers of help with being collection points. While I shouldn’t be surprised, because Shetland residents have a long history of generosity, I am amazed at the quantity of stuff that has since come FLOODING in. I have filled boxes of hats, gloves, scarves and blankets as well as jackets in all shapes and sizes and more shoes and boots than a centipede would know what to do with! So much lovely stuff and so many kind people: from pensioners knitting blanket squares to the children helping to sew them together into blankets, shops donating stock and packing boxes, folk clearing out their cupboards to folk going around the charity shops to buy things to donate, saying this way two charities benefit! I take my hat off to the lot of you – in fact I think I may have packed it! 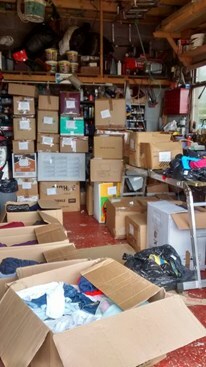 The donations have come in from all over Shetland, from Unst – the most northerly inhabited island in the UK – to Fair Isle, 50 miles to the south of the mainland of Shetland. They have travelled in cars, vans, pick-ups, buses and ferries to be packed in our garage in Voe. We have had socks knitted by a 93 year old lady and a child of 4 helping to sew blanket squares together. It has been a true community effort. 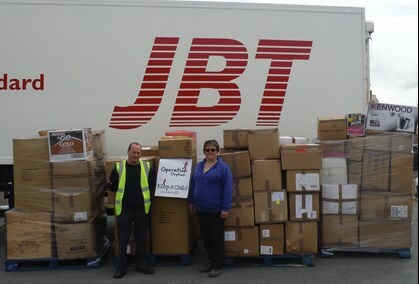 The total number of boxes being delivered to Nottingham is 109, piled high on 4 pallets with many, many thanks to JBT who are doing this for FREE and to Shetland Rotary for their support which started the ball rolling. I would like to thank EACH AND EVERY PERSON who has been involved, whether individually, as part of a group, school, care centre or business. Whether you have donated one hat or a bag full of coats or more, acted as a collection point or helped ferry donations around. Drivers, collectors, stitchers, donators, packers – Shetland, you should be proud – there are going to be a lot of children very grateful for what we are sending them to help them through this winter. EVERY donation will help a child. At the end of October, I will be privileged to see the process through to the end in Moldova as part of the distribution trip. Some of the items donated from Shetland will no doubt be among those we give out – and some will go to Nepal and Ukraine. I will be taking photos that I will share when I get back, doubtless with a story to tell of how these items really will make a difference.